President Donald Trump is controversial and polarizing. This is not a profound assertion. That President Trump is a “tragic hero” might be. In Victor Davis Hanson’s telling, President Trump maybe something akin to Sophocles’s Ajax or Pike Bishop in The Wild Bunch: “The tragic hero’s change of fortune . . . is due to an innate flaw (hamartia). . . . Nonetheless, in at least some cases, this intrinsic and usually uncivilized trait can be of service to the community, albeit usually expressed fully only at the expense of the hero’s own fortune.” Hanson sees Trump as one of Orwell’s “rough men” who will be scorned by all once his dirty work is done. The Case for Trump is not like most right-wing pamphlets masquerading as books. Hanson, a historian of war and a Classics scholar, is not your typical news network blowhard with a ghost writer. As such, The Case for Trump is riddled with allusions to ancient Greece and the Roman republic. Rather than simply the vulgarian of mass media caricature, Hanson sees Trump as more akin to the Roman populist Catiline or even the Missouri-bred President Harry Truman, who was known for his sharp tongue and penchant for picking fights with the media and Washington itself. Told in five parts, The Case for Trump outlines all of the reasons why Hanson voted for Trump in 2016 and why half of the United States continues to back him, even if they profess a dislike for his personality. Furthermore, Trump won in 2016 and continues to win because tone-deaf liberals and progressives constantly reveal their true venom for workers, rural whites, and those citizens who do not live on the coast. Hillary Clinton is a prime example, and when not blaming everyone else for her historic loss, she’s defaming American citizens to members of the foreign smart set at ritzy conferences. Hanson’s volume is very pro-Trump, but does admit that the president has not really expanded his base since the election, and only recently realized that fighting against the “deep state” cannot extricate the president from the necessity of having to work with the FBI, CIA, and other Washington insiders. Hanson also recognizes that when President Trump’s tenure ends, he will never be invited to Washington functions or mug in front of the cameras with past chief executives. Where The Case for Trump truly shines is in depicting Trump’s enemies. Hanson skewers the “deep state,” the media, and the bicoastal elite for their incestuousness and disdain for the hoi polloi. Thanks to degrees from the top universities, friends in high places, and an adherence to political correctness, these people feel that they are not only better than Michigan machinists or West Virginia coal miners, but that they have the right to disparage their social “inferiors” at almost every occasion. Trump has leveraged this class bias and exposed the inherent liberalism of America’s journalists in order to confirm to his supporters that the elites really do look down their noses at them. The Case for Trump will not be read by Democratic voters or die-hard liberals. It should be, however. 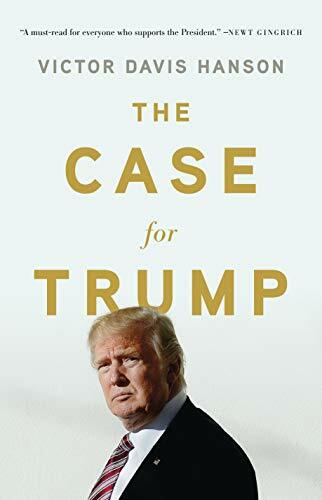 Much like Bernie Sanders, the wild-haired democratic socialist who exposed the calcified Democratic Party as corrupt and beholden to the desires of the high-tech donor class, Donald Trump successfully put the bipartisan consensus on trial and won. Simply calling Trump supporters “racist,” “homophobic,” or “xenophobic” will only serve to irritate the lower middle class. The Case for Trump, plus the recent election of Jair Bolsonaro in Brazil (where whites are not the racial majority), should wake up Democrats and their supporters to the fact that unpopular progressive policies (more regulation, de-growth in the economy, open borders) and racial hectoring against whites will never unify a country.